Notice the beginning of the caterpillar slippage on Trudeau. Well, well, well… Canadian socialist pretty boy Justin Trudeau evidently is fake in more ways than one. Before I get into his betrayal of President Trump at the G7 summit in Canada, we must address the wandering caterpillar that was once his left eyebrow. I kid you not… it was on live TV and is not Photoshopped as far as I can tell. Makeup somebody… anybody! Face malfunction in action. It does make you wonder what other parts of Trudeau’s presence are fake or enhanced. I really don’t want to know on second thought. We already know he has a terrible time with the truth and now eyebrow slippage. The award for best tweet though goes to Governor Mike Huckabee. It’s pure gold. Onto more pressing matters now that we know Trudeau wears fake eyebrows and probably makeup. Except of course Trump will now probably impose fake eyebrow tariffs and rightly so. Good times. 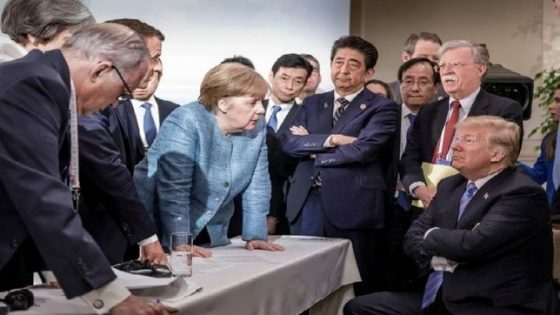 As you know, the G7 summit was not warm and cuddly for President Trump. But give Trump his due… he stood his ground on tariffs and did not budge. And as soon as Trump was in the air on his way to Singapore on a 20-hour flight to meet North Korea’s Kim Jong-Un, Trudeau proceeded to hold a news conference and stab President Trump in the back. Nice. Not exactly the behavior we have come to expect from our friends to the north. They chose very poorly when they elected this dufus. The world leaders at the G7 summit had reached a tentative agreement on tariffs that was to be a joint statement… but no more. We will no longer sign the communique. Trudeau’s press conference made his stance clear when he said that Canada will not be “pushed around” by the U.S. and called Trump’s tariffs “unjust.” Spoken like a true one-world communist. Trudeau’s treachery was relayed to President Trump on board Air Force One after the summit. “And I’ll tell you this, to my friends in Canada, that was one of the worst political miscalculations of a Canadian leader in modern Canadian history,” Navarro continued. “All Justin Trudeau had to do was take the win. President Trump did the courtesy to Justin Trudeau to travel up to Quebec for that summit. He had other things, bigger things on his plate in Singapore. And what did Trudeau did — do as soon as — as soon as the plane took off from Canadian airspace, Trudeau stuck our President in the back. That will not stand.” Damn straight it won’t. I don’t think I have ever seen this kind of fiery rhetoric come out of the White House in my lifetime. I have to say I find it somewhat refreshing. Trump has Pompeo and Bolton with him going to North Korea. They were also at the G7 summit. Boy, would I love to know what they said on all this. I imagine they 100 percent approve. So do I.
Navarro went on to call Canada’s high tariffs on American dairy products and planned retaliatory tariffs, an “attack on our political system.” So, instead of being fair to the U.S., Trudeau has decided on a form of economic warfare because we won’t keep in place trade agreements that hurt us and benefit Canada. Well, it’s time that stopped. At first, I did not support Trump in this tariff fight as they usually go very wrong, very fast. But, I’m beginning to think he’s on to something here and it’s time that America gets a fair shake on trade for a change. “And as far as this retaliation goes, the American press needs to do a much better job of what the Canadians are getting ready to do because it’s nothing short of an attack on our political system and it’s nothing short of Canada trying to raise its high protectionist barriers even higher on things like maple syrup and other goods,” Navarro said. And Navarro is far from alone in his sentiments that he expressed here on Trudeau and Canada. Enter top White House economic adviser Larry Kudlow. He said Trudeau “stabbed us in the back” with a “double cross” at the G7 summit. Them’s fightin’ words. In a blazing interview, Kudlow called Trudeau’s press conference a “sophomoric, political stunt for domestic consumption.” “President Trump played that process in good faith,” Kudlow said on CNN’s “State of the Union” Sunday. “So, I ask you: He gets up in the airplane and leaves, and then Trudeau starts blasting him at a domestic news conference? I am sorry, that’s a betrayal. That’s a double cross.” Yeah, you might want to think twice before taking on the world’s lone super power… Canada is picking a fight they won’t win. I would say that the trade wars are on and Trudeau is about to find out what it means to be at odds with the United States of America and a sitting President. Perhaps he should superglue those caterpillars on better… this is going to be a VERY bumpy ride for the Great White North and anyone else who decides to screw with us.